The Breakdown: With the graduation the first running back in program history to lead the MAC in rushing twice, there might be some anxiety on how the Warrior running game will take shape. However, at a school that has produced an All-MAC running back in each of the last 10 years, Clark said there are plenty of options that can pick up where Blake Bowman ’17 left off. First Team All-MAC running back ... a CoSIDA Academic All-District selection ... 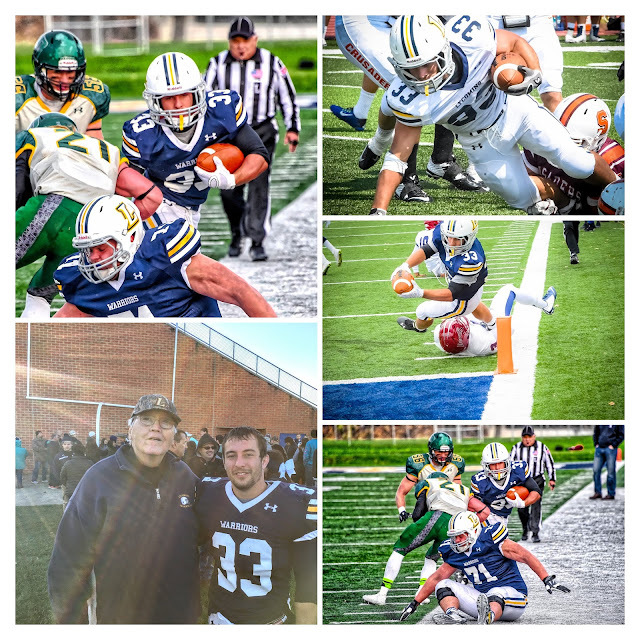 Academic All-MAC ... first Warrior to lead MAC in rushing in back-to-back years ... posted 93.6 yards per game ... led the MAC in rushing touchdowns and finished 36th in Division III with 12 ... second in the MAC with 113.56 all-purpose yards per game and third with 12 total touchdowns ... started nine games at running back ... ran for 842 yards on 171 carries ... had a season-high 164 yards against Susquehanna, scoring three touchdowns ... also had 112 yards and three scores against King’s ... rushed for more than 100 yards four times ...had nine receptions for 96 yards on the year ... finished his career second in school history with 31 rushing yards, fifth with 2,516 rushing yards and third with an average of 5.16 yards per rush ... a member of the MAC Academic Honor Roll … earned a spot on the Hampshire Honor Society. A Look at 2017Senior Sam Dressler (Riverside, Pa./Danville Area) heads up the group. A tough, smart runner that loves contact, Dressler gives the team a physical presence in the backfield. He averaged 3.2 yards per carry on 41 touches as a junior and followed that by making some leaps during spring ball and nearly single-handedly closing out the win in Canada with six straight rushes in the final drive of the fourth quarter. 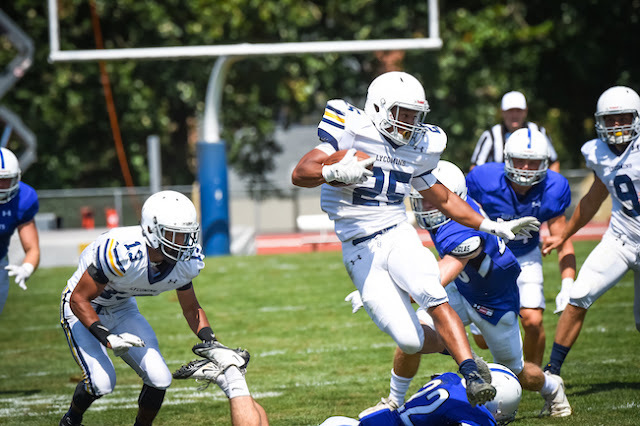 Sophomore Dante Gipson (Bordentown, N.J./Bordentown Regional) gives the team a speedy, shifty running back who can make things happen not just in the backfield, but also in the slot as a receiver. He rushed for 240 yards on 61 carries as a freshmen and added 18 catches for 154 yards and a score. Clark said finding ways to make sure Gipson gets touches will be critical to the team’s success. Sophomore Jacob Fimbres (La Habra, Calif./Sonora), a mid-year transfer, also gives the team another explosively quick, shifty running back. A transfer from Pasedena City College, he rushed for 73 yards and a touchdown in his lone season at the California junior college. 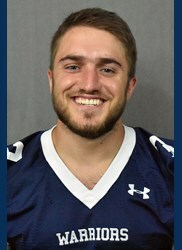 Sophomore Keith Batkowski (Montoursville, Pa./Montoursville Area) has also improved greatly during his time in the program after an all-state career at Montoursville Area, while junior Kyle Puza (Manville, N.J./Manville) continues to improve as a blocking fullback. Who Returns: Keith Batkowski, So., Montoursville, Pa./Montoursville Area; Sam Dressler, Sr., Riverside, Pa./Danville Area; Dante Gipson, So., Bordentown, N.J./Bordentown Regional; Kyle Puza, Jr., Manville, N.J./Manville. Newcomers: Tommy Cruz-Nieves, Fr., Wayne, N.J./Passaic County Tech; Jacob Fimbres, So., La Habra, Calif./Sonora; Danny Lozada, Fr., Auburn, Pa./Schuylkill Haven; Hayden Rooney, Fr., Penndel, Pa./Neshminy; Aaron Veloz, Fr., Lewisburg, Pa./Lewisburg Area.